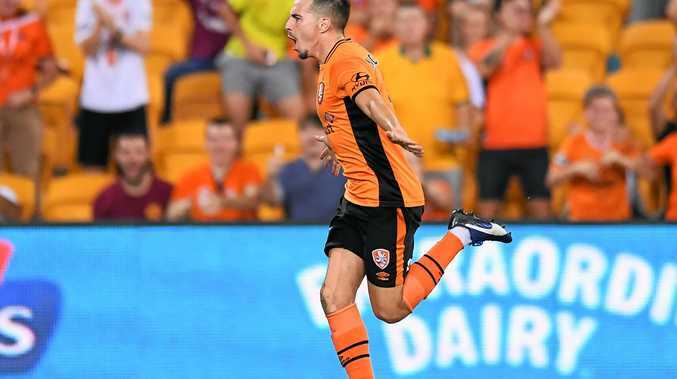 BRISBANE coach John Aloisi slammed the club's detractors after a Jamie Maclaren wonder goal secured the Roar a 1-0 win over a weakened Melbourne Victory at Suncorp Stadium on Saturday night. The Roar put a week of turmoil behind them to secure their ninth win of the season and move to 36 points and level with third-placed Melbourne City. "The boys worked so hard to get the result and show everyone that we're strong together," Aloisi said. The Roar went into match minus suspended goalkeeper Michael Theo and banned assistant coach Ross Aloisi, who were punished for their actions during and after Brisbane's 2-1 loss to Adelaide United last Sunday. It led to stinging criticism of the club's culture from former Roar youth team coach Josh McCloughan via an opinion piece. The Roar also had to deal with the resignation of the club's high-performance boss Karl Dodd less than 24 hours before last night's game. But a defiant John Aloisi was adamant the Roar were "moving in the right direction". "It's been a tough week because a lot of things have been said about individuals about the club in general but ... you can tell if a football team or a club are in turmoil when players give up. This team doesn't give up. This team is strong, this club is strong," the Roar coach said. Maclaren's 51st minute goal was not only strong but also sublime as he got the better of Victory defenders Alan Baro and Nick Ansell before catching goalkeeper Lawrence Thomas off his line with a 20-metre strike. It was his 15th goal of the season and his seventh in his past six A-League matches as the spurned Socceroo sent national coach Ange Postecoglou another message. Second-placed Victory's loss ended their unlikely bid to overtake Sydney FC at the top of the ladder, with the Sky Blues having clinched the Premier's Plate. Victory coach Kevin Muscat was proud of his team's effort, particularly in the absence of attacking weapons Besart Berisha (Kosovo), Marco Rojas (New Zealand) James Troisi (Socceroos) and Jai Ingham (New Zealand), who were away on international duty. But he was frustrated at the way his side conceded the game's only goal. "It was a great strike by Jamie but it's basic defending - it should be dealt with," Muscat said. The Victory coach also felt his team had legitimate claims for a penalty when the ball seemed to strike the arm of Roar defender Jack Hingert just minutes before Maclaren scored up the other end. "It's hit him in the arm. I could see it from where I was," Muscat said. "Maybe being on the different angle, be it that I'm a lot further away than the referee, maybe I had a better view, but it was penalty, it's a handball."